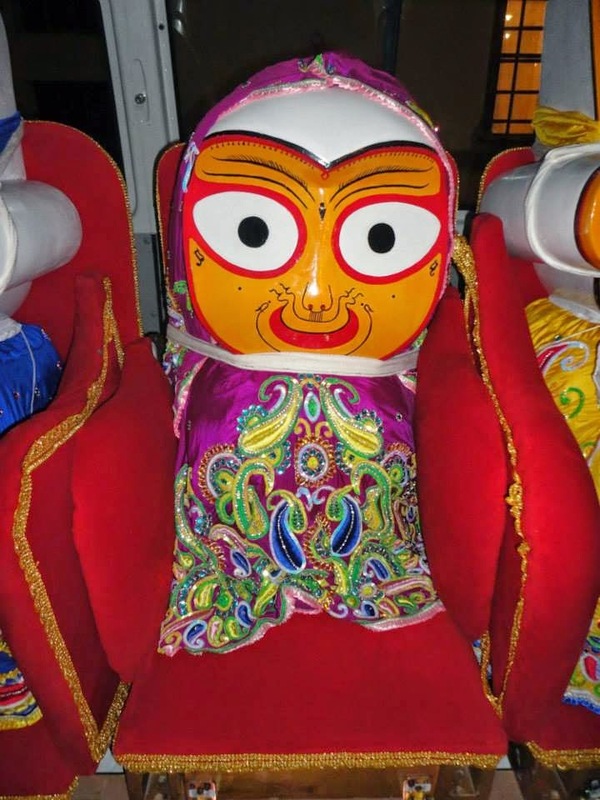 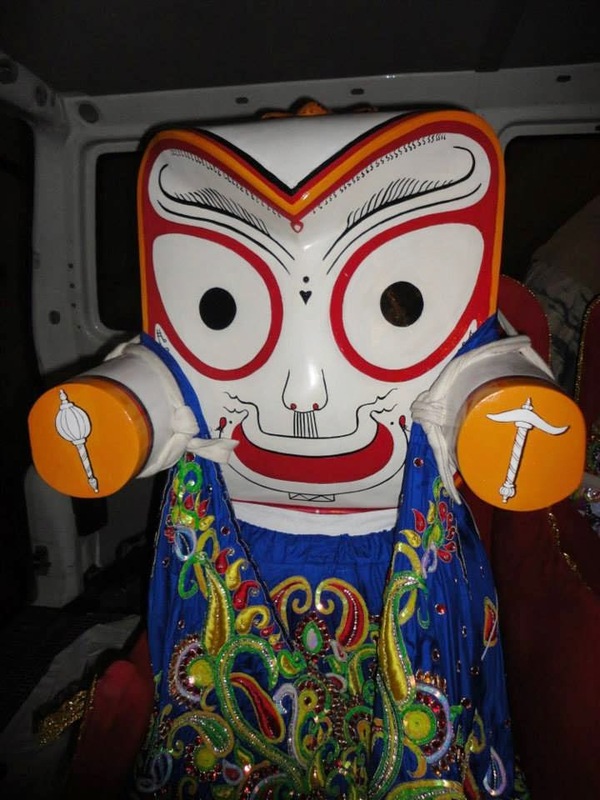 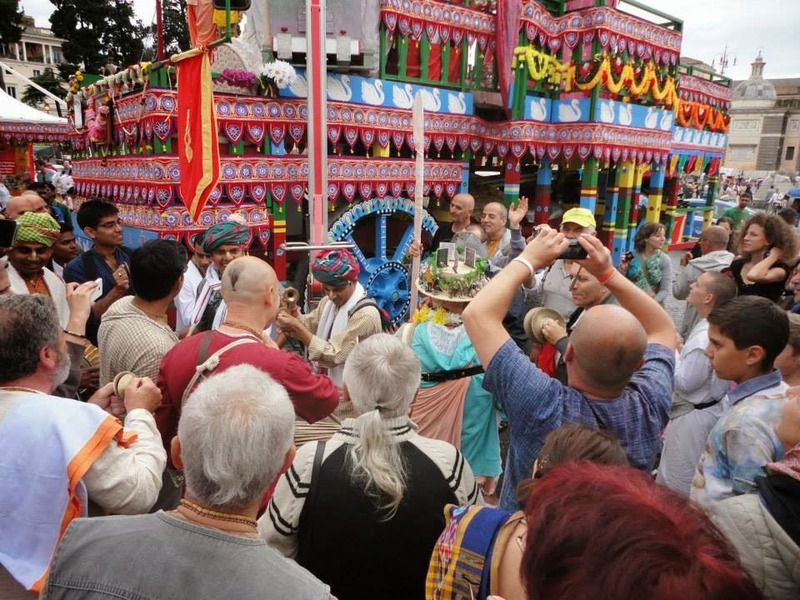 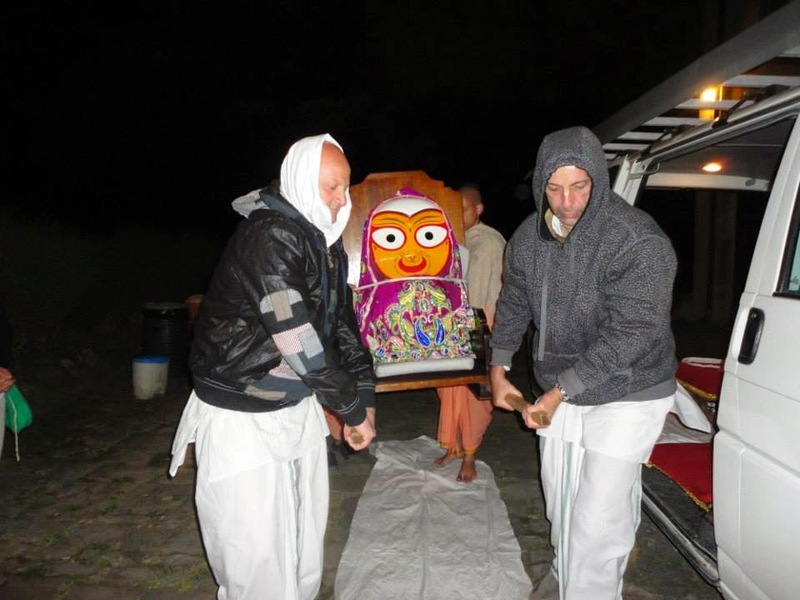 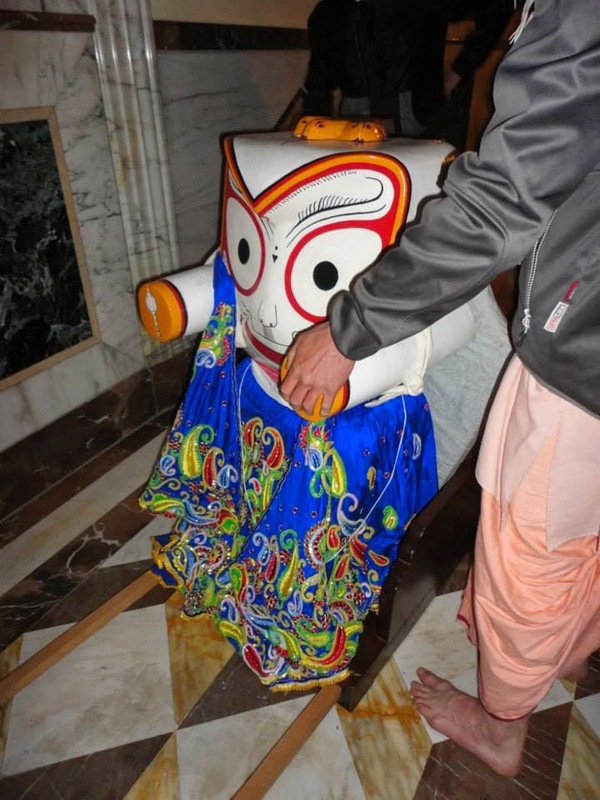 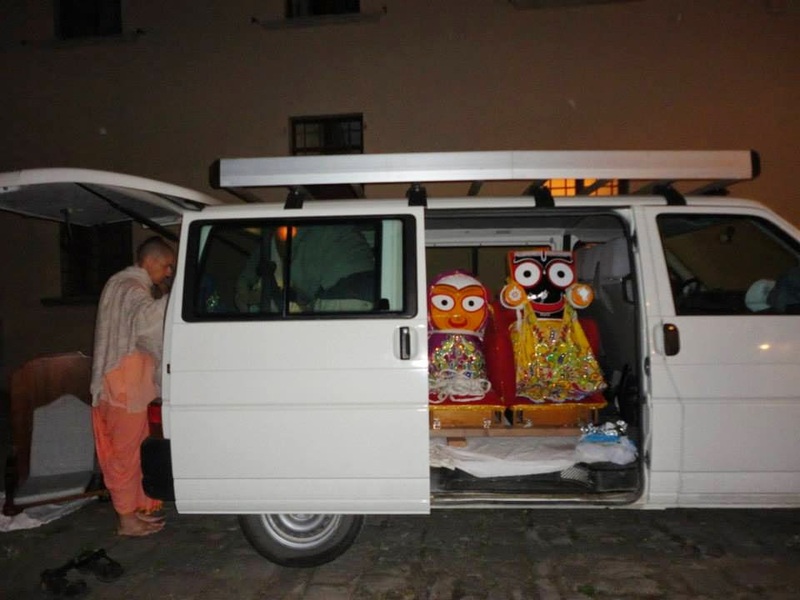 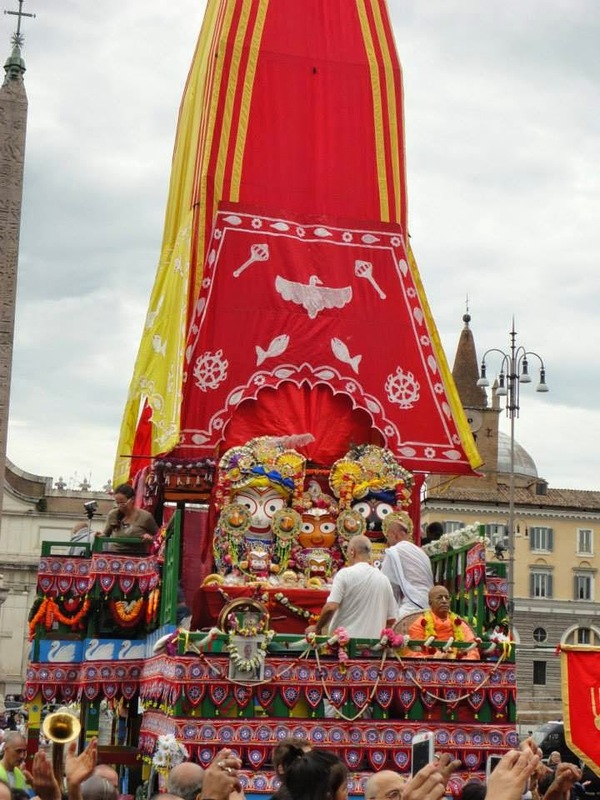 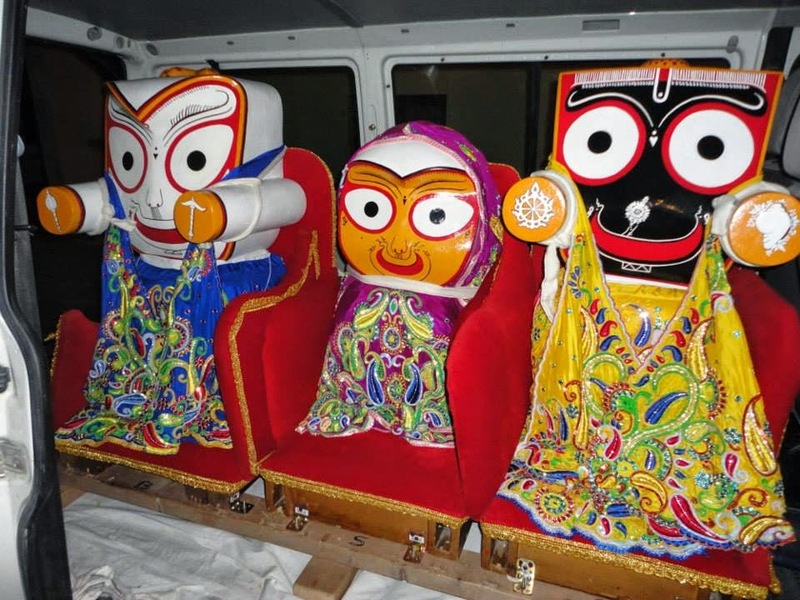 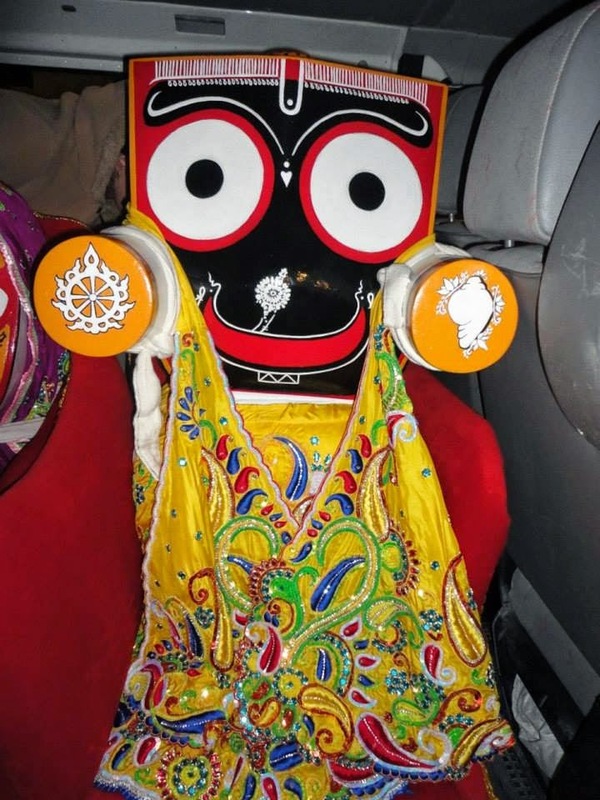 In Rome the rain started early in the morning, but at 16:50, as soon Lord Jagannatha took His place on the cart the rain stopped and during all the festival, from 17:00 to 20:30 there was no rain, the sky had a beautiful blue color and the sun came out. 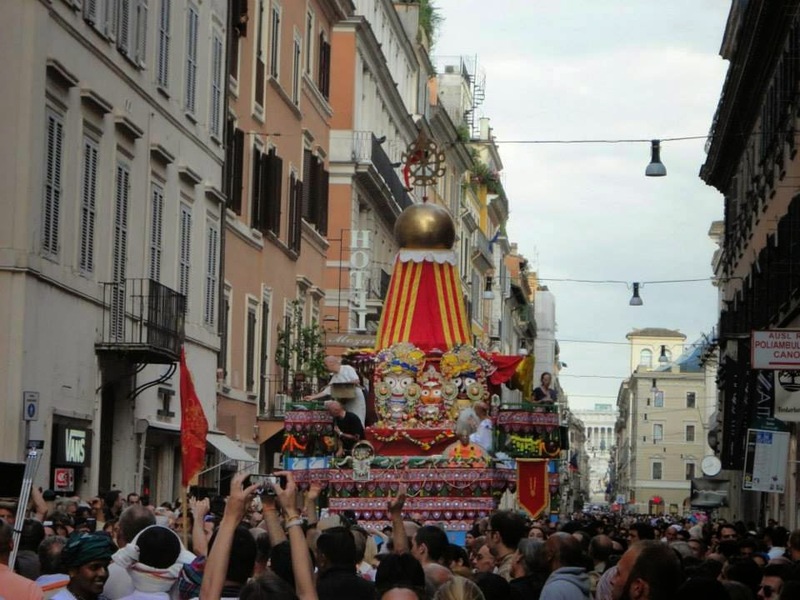 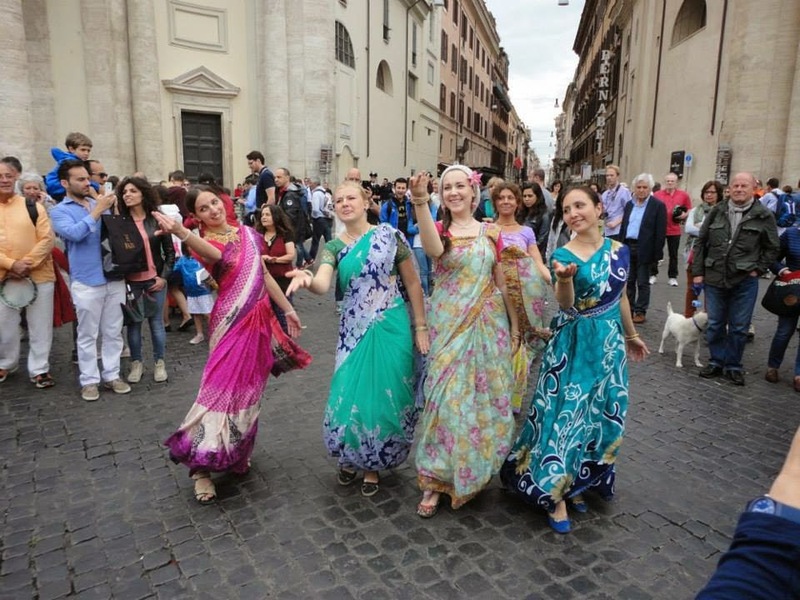 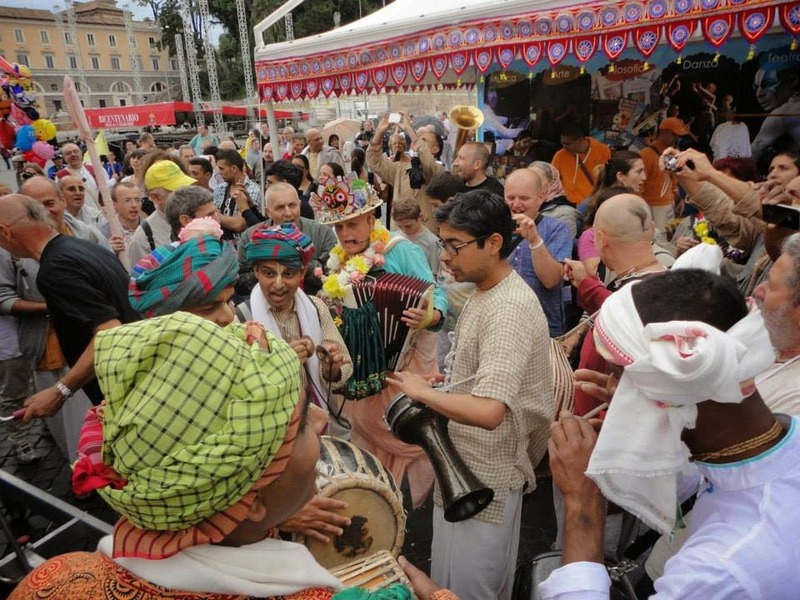 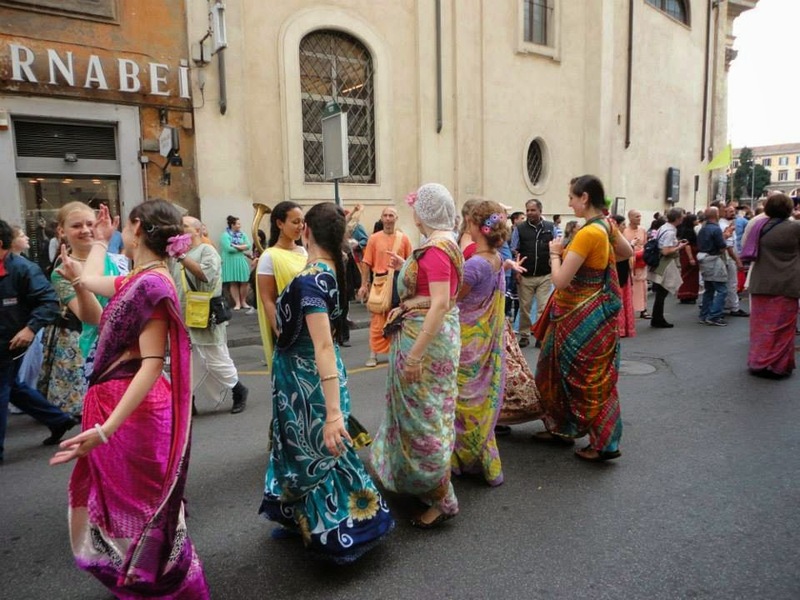 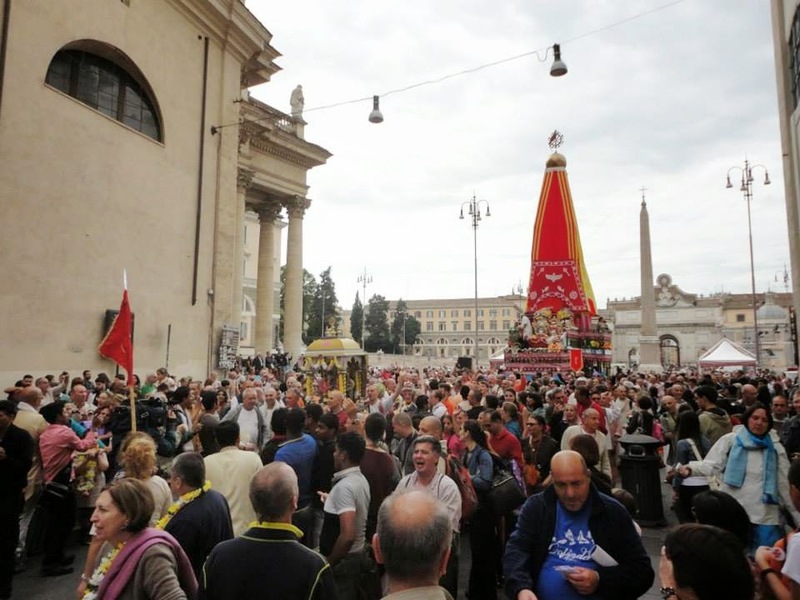 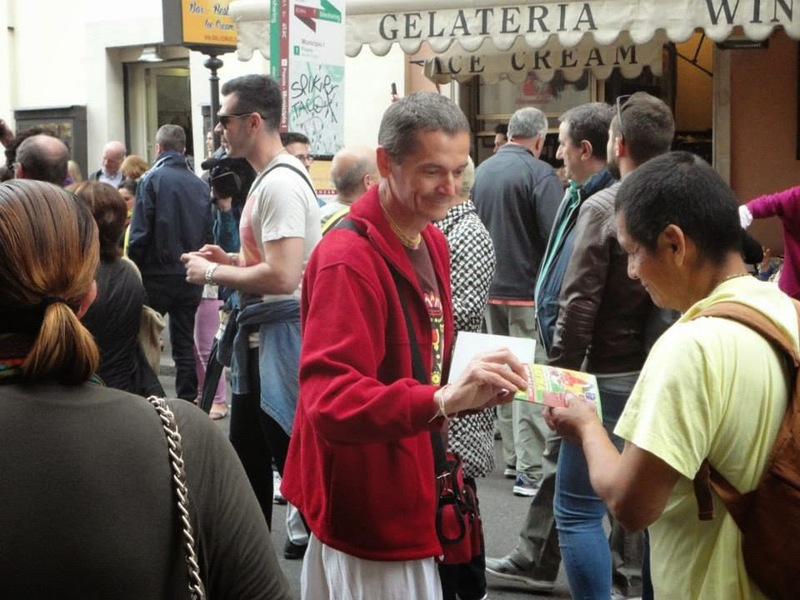 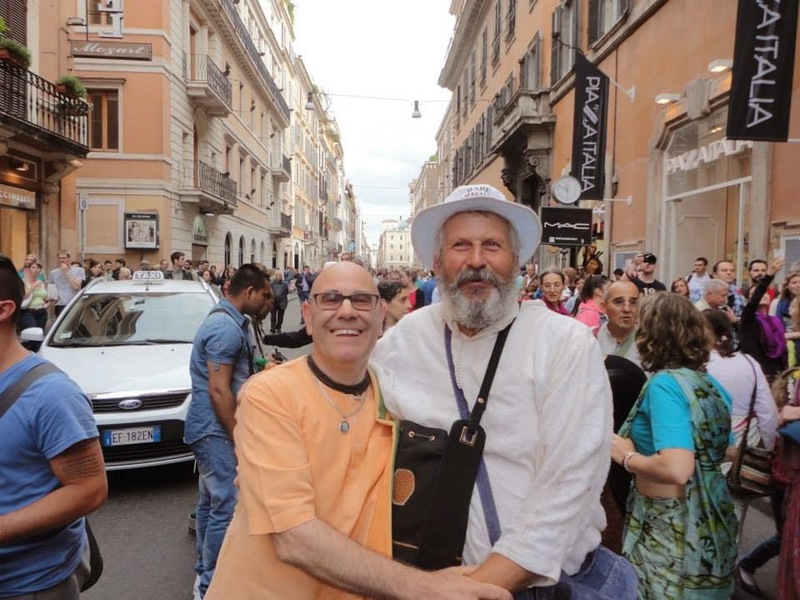 Thousands of devotees, friends and general people enjoyed the blissful atmosphere that for 3 hours inundated the center of Rome. 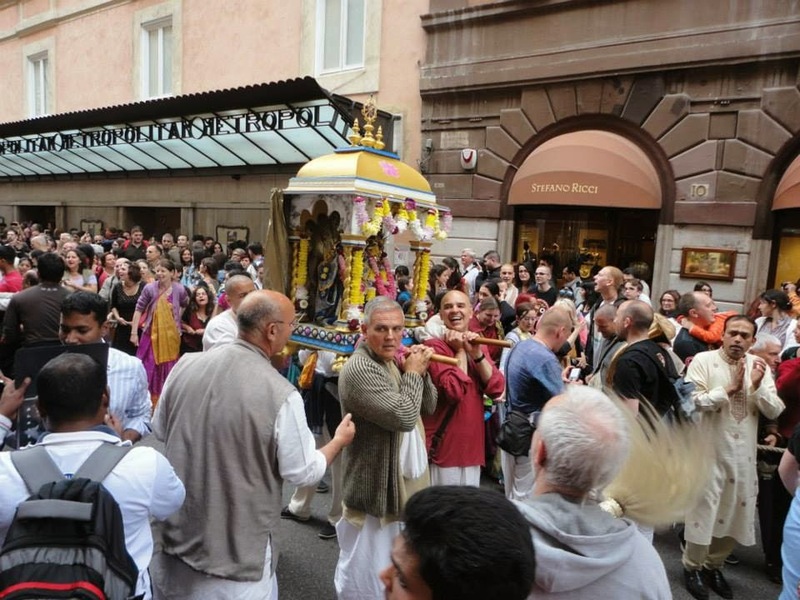 I have never seen devotees so happy in my life! 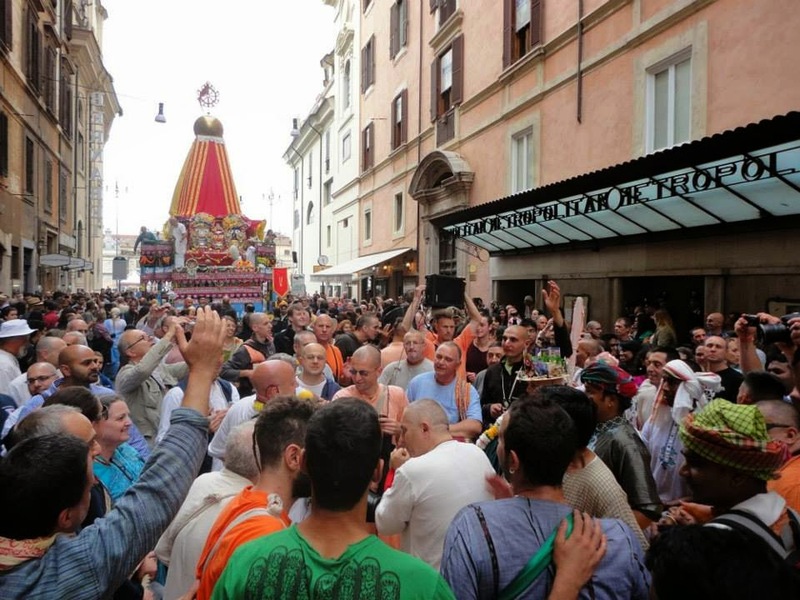 After 40 years from Srila Prabhupada’s visit in Rome, this was the best celebration that all the Italian devotee could offer to our beloved Spiritual Master. 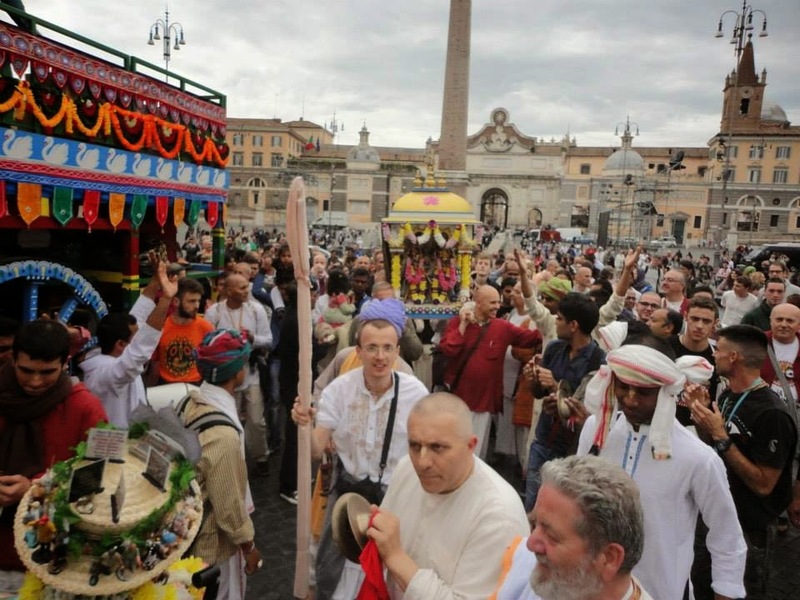 Almost all the Italian devotee were present at this event. 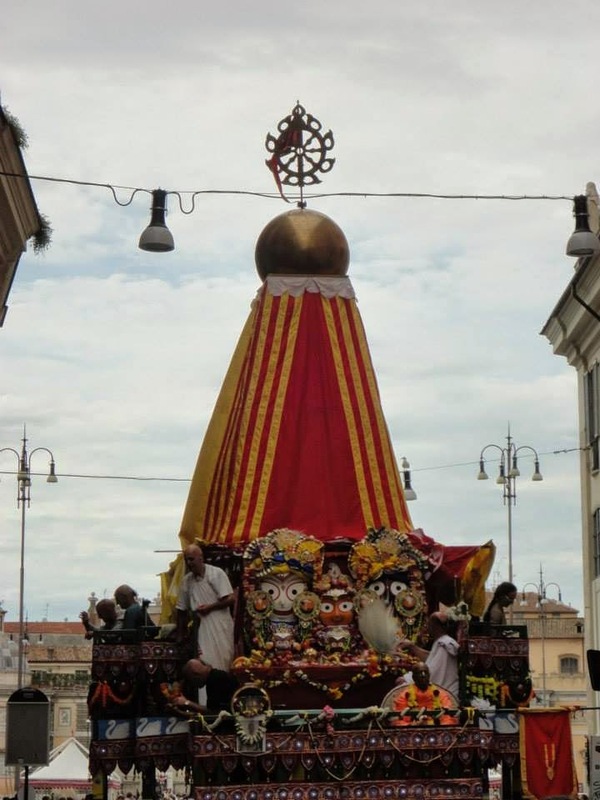 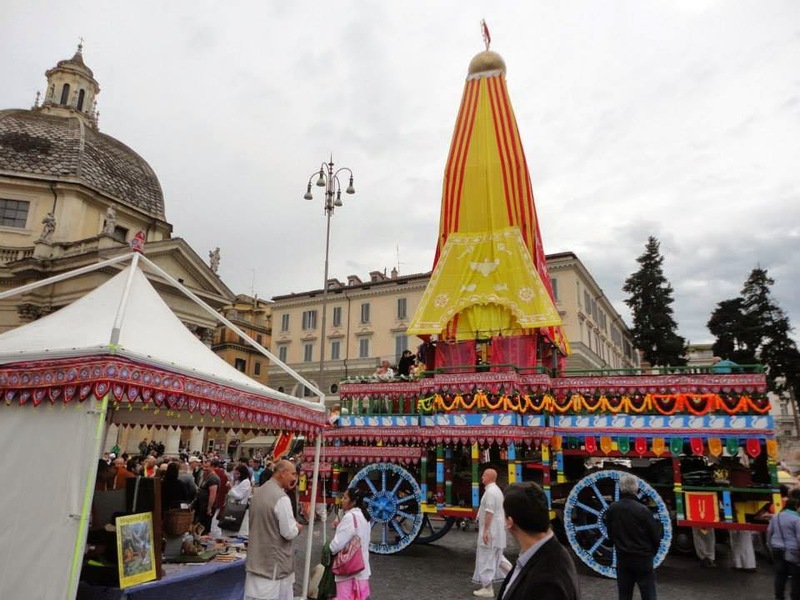 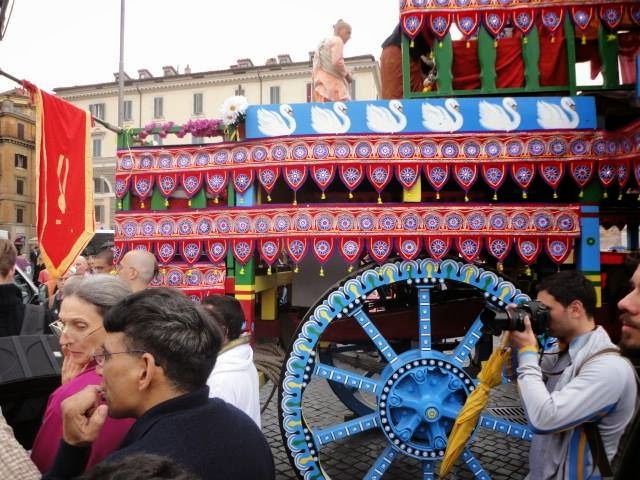 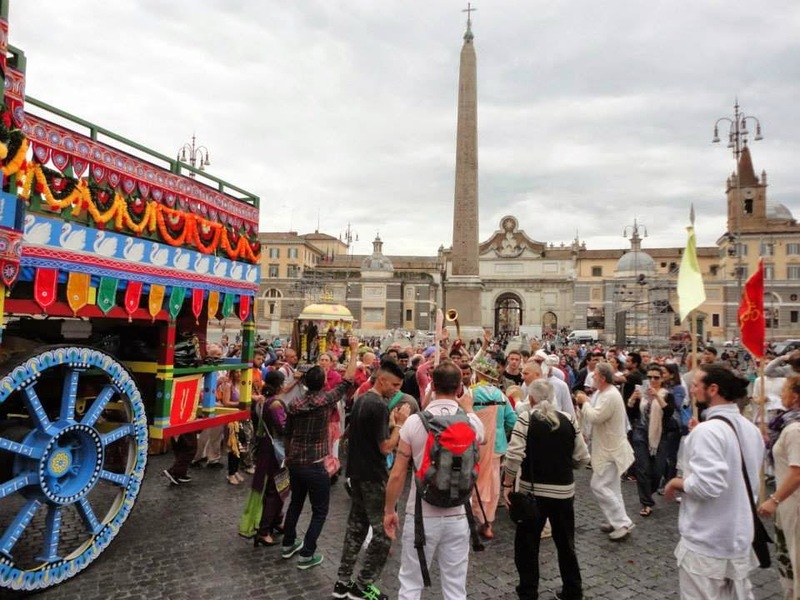 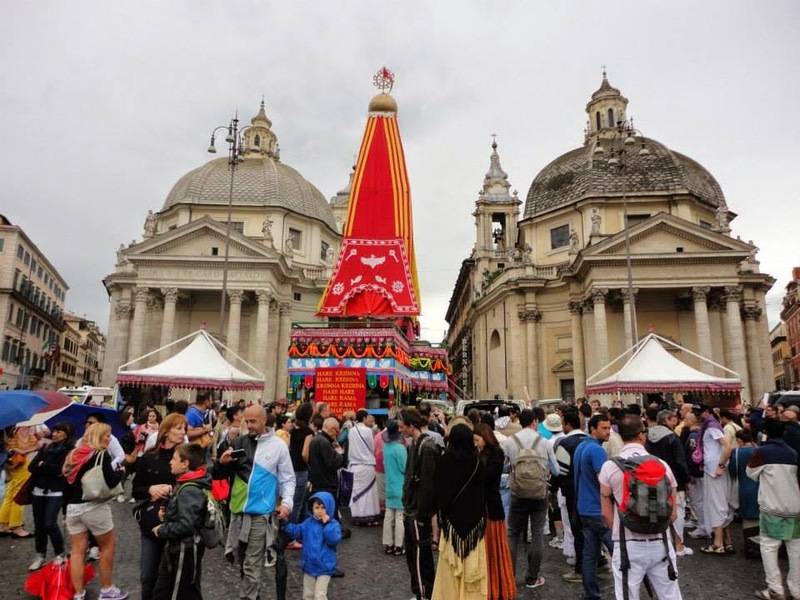 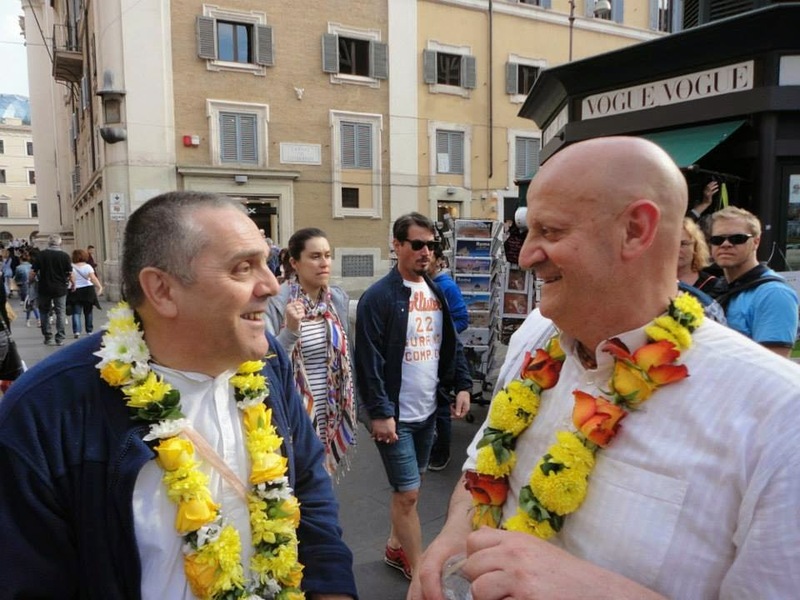 A bus came from Milano Yatra and hundreds of other cars from all over Italy gathered at Piazza Del Popolo for the Ratha Yatra. 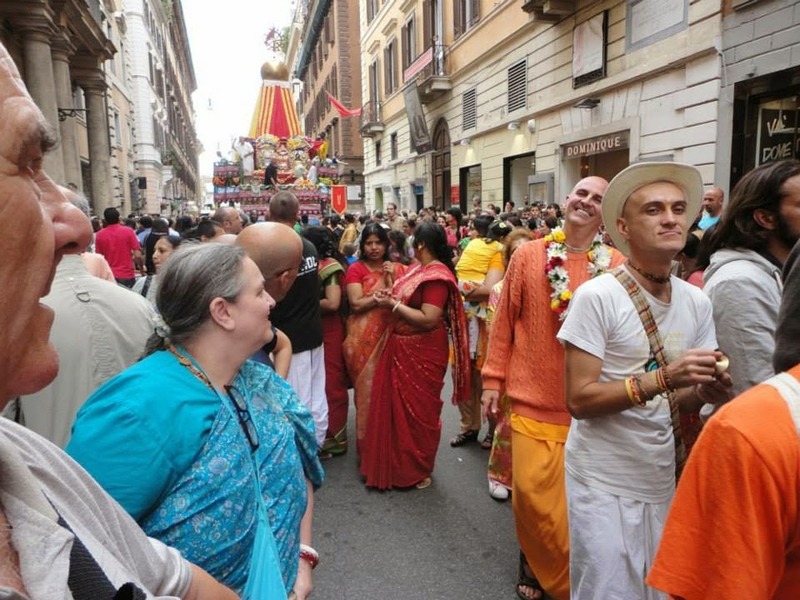 HH Mahavisnu Swami, Madhusevita Prabhu and Alikrsna Devi Dasi, HG Dhananjaya and Bala Gopala Dasi, HG Prabhavishnu Prabhu, HG Dayanidhi Prabhu and specially Mukundananda Prabhu and Anubhava Devi Dasi who organized and accomplished almost everything! 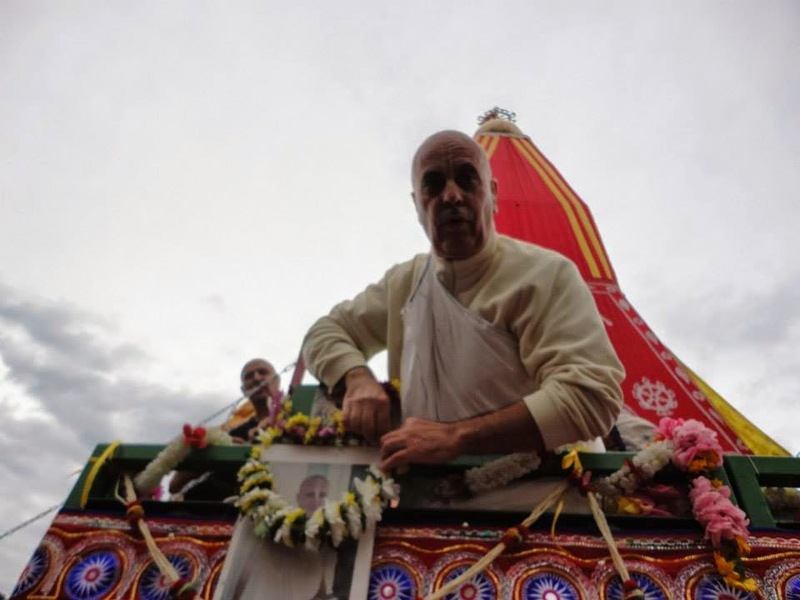 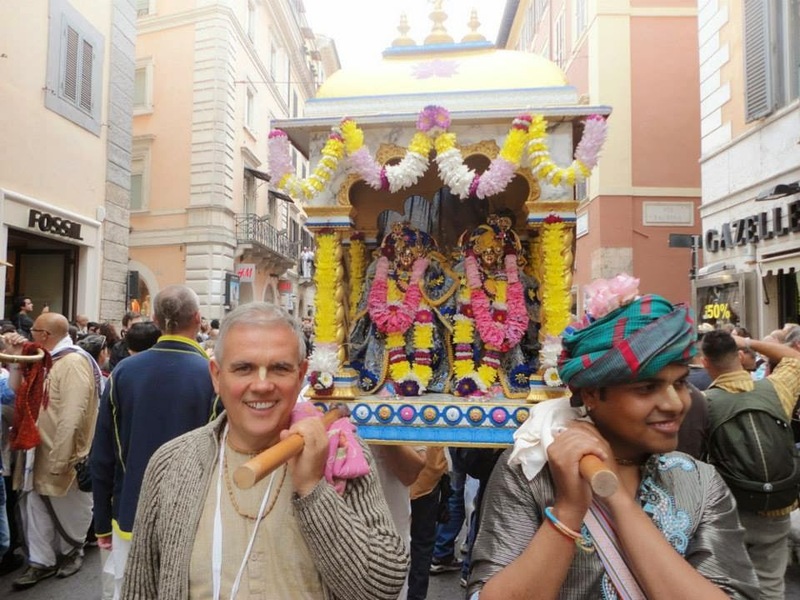 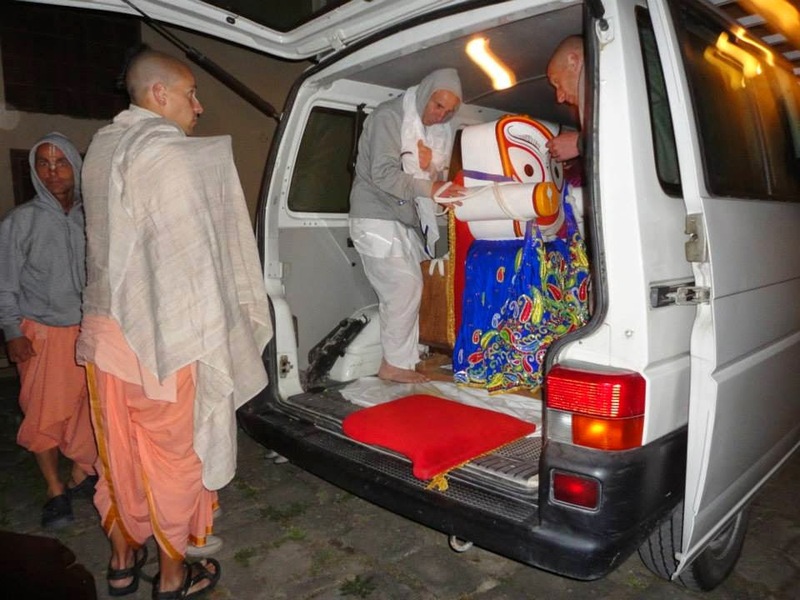 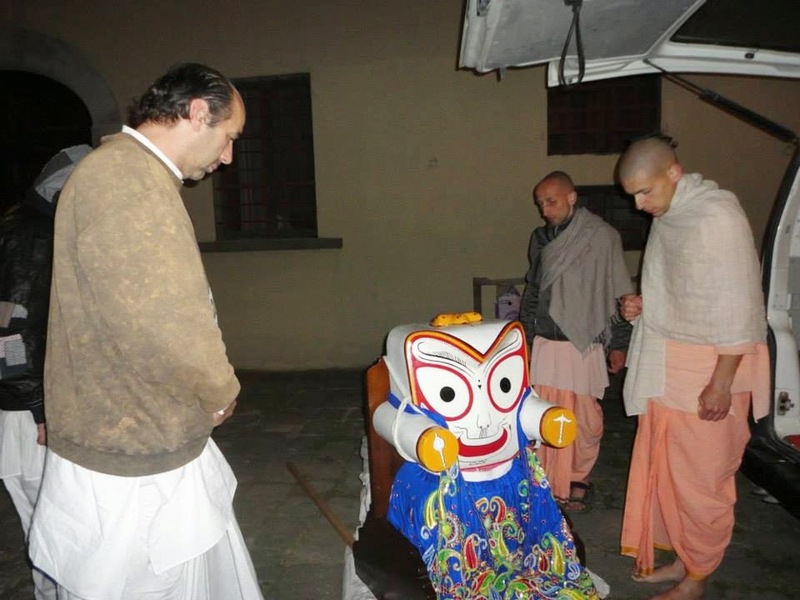 Also Dhruva Prabhu from Milan yatra who drove the cart and all the devotees from Milan. 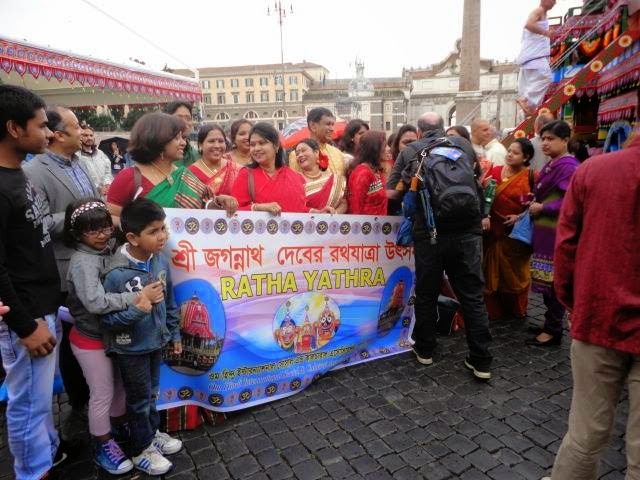 All the pujaris from Villa Vrndavana who brought Lord Jagannatha, Sri Subhadra and Sri Balarama from Their abode in Florence. 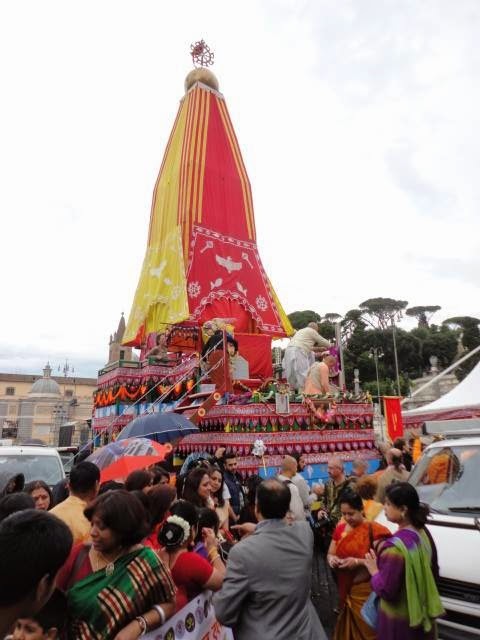 And all the devotee that participated and contributed to make this celebration a big success! 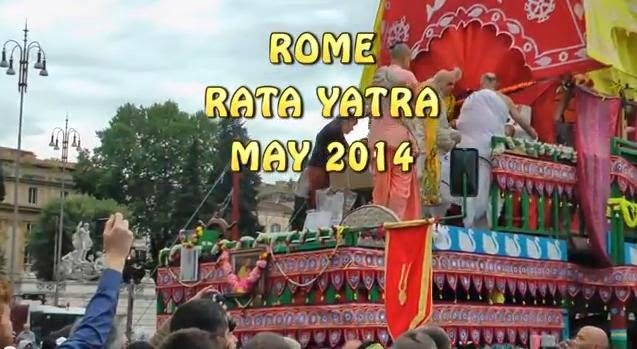 Enjoy the below video with the highlights of the Festival made by Arthia Devi Dasi (my wife) and myself.